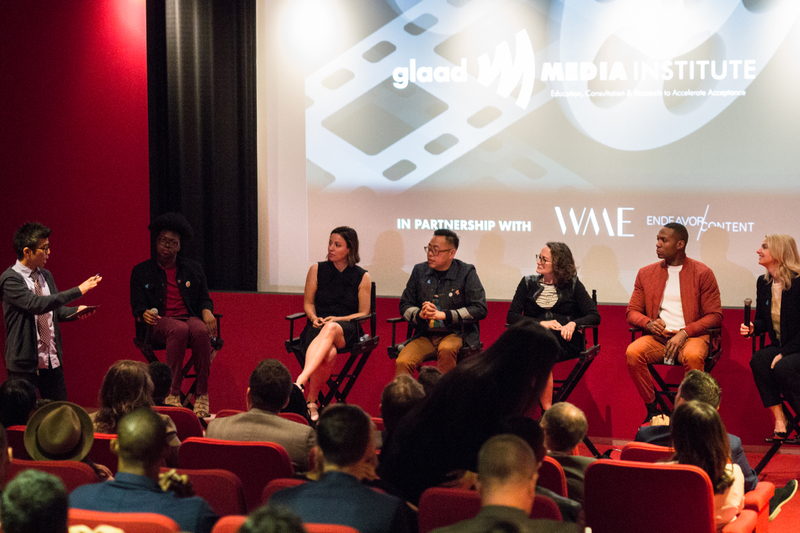 At the Beverly Hills headquarters of WME/Endeavor Content Tuesday, GLAAD president Sarah Kate Ellis disclosed a “bleak” assessment of how major Hollywood films told LGBTQ narratives in 2017. According to her organization’s sixth annual Studio Responsibility Index (SRI), 20th Century Fox, Lionsgate, Paramount, Sony, Universal, Walt Disney, and Warner Bros. released a combined 109 features last year, just 14 of which were LGBTQ-inclusive (12.8 percent). That’s an 18.4 percent decrease from 2016, when there were 23 such movies out of 125 possibilities. Providing parts for recognizable lesbian, gay, bisexual, transgender, or queer characters is the bare minimum GLAAD wishes to see from studios — each film would ideally also pass “The Vito Russo Test,” meaning those roles are vital to the plot, and the individuals are defined by more than their sexual orientation or gender identity. In both 2016 and 2017, only nine titles met “The Vito Russo Test” rubric. Universal received the best marks among the seven largest studios, having last year debuted four LGBTQ-inclusive films (“Get Out,” “Fifty Shades Darker,” “Happy Death Day,” and “Pitch Perfect 3”). Still, that translated to an “insufficient” grade (three stars out of five), a tally shared by 20th Century Fox, a likely exclusion from the next SRI, as it is now a Walt Disney-owned entity. “Poor” or two-star ratings went to Paramount, Sony, and Walt Disney, while Lionsgate and Warner Bros. each earned “failing” ranks, with two LGBTQ-inclusive films apiece. Better representation comes courtesy of the indie film world (see “Call Me By Your Name,” “A Fantastic Woman” and “Lady Bird”), although current box office leader “Deadpool 2” does spotlight the LGBTQ romance of Negasonic Teenage Warhead and Yukio. While one 2016 studio release — Paramount’s “Zoolander 2” — included a transgender character (although not a respectful depiction), last year’s biggest films offerings had no transgender roles. Asian/Pacific Islander LGBTQ characters were also absent from the examined 2017 films, a statistic that will not be repeated next year: “Superstore” co-star Nico Santos plays an LGBTQ part in Warner Bros.’ “Crazy Rich Asians,” out August 17. On a more positive note that reversed the observed trend from the previous two years, a majority of LGBTQ individuals on film last year were people of color (57 percent). Based on these statistics, GLAAD is challenging the seven studios to make at least 20 percent of its slates LGBTQ-inclusive by 2021, a number that jumps to 50 percent in 2024. At the event, Endeavor Content agent Kevin Iwashina pledged that his company will be the first content studio to commit to the former goal. “On the screen, record-breaking films like ‘Black Panther’ and ‘Wonder Woman’ proved that not only does inclusion make great storytelling, but let’s be honest, inclusion is great for the bottom line,” said Ellis, before joining Santos, “Insecure” writer Ben Cory Jones, studio executive-turned-producer Nina Jacobson, plus “Pitch Perfect 3” co-writer and “Blockers” director Kay Cannon for a panel discussion, moderated by the LA Times’ Tre’vell Anderson. During the talk, Ellis addressed why television has been the more progressive medium for championing LGBTQ characters. Read the full 2018 SRI here.